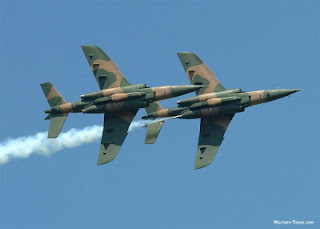 The Nigeria Air Force has destroyed a Boko Haram training camp in Borno state as it launches attacks on the terror sect. The Nigerian Air Force says its Air Task Force of Operation Lafiya Dole has destroyed a Boko Haram Terrorist Training Camp in Malkonory and also destroyed a BHT vehicle near Tumbun Rego in Northern Borno, the News Agency of Nigeria, NAN reports. Air Commodore Ibikunle Daramola, NAF Director of Public Relations and Information, who disclosed this in a statement on Thursday in Abuja, said the operation was carried out on October 1 1. “The attack on the Training Camp was undertaken October 11, on the heels of credible intelligence reports indicating that several structures, cleverly camouflaged under thick vegetation in the settlement, were being used to harbour and train BHT fighters,” he said. Daramola said that a NAF Intelligence, Surveillance and Reconnaissance platform subsequently confirmed features such as training dummies and trenches along with a large number of adult males within the camp. The NAF spokesman said that the few surviving BHTs were mopped-up in follow-on attacks. “Similarly, following Intelligence reports indicating the presence of BHT vehicles on the move around Matari Village along the Metele-Kangarawa-Tumbun Rego axis on October 9. “A NAF ISR platform was detailed to reconnoitre the area and subsequently spotted one of the BHT vehicles, a gun truck, along the road heading towards Tumbun Rego. “Accordingly, an Alpha Jet aircraft was scrambled to attack the vehicle, with direct hits recorded on the target, leading to the destruction of the gun truck,” he said. The spokesman said that the NAF, working in concert with surface forces, would sustain the momentum of operations with a view to destroying remnants of the BHTs on the fringes of Lake Chad and other areas in Northern Borno.